Leapfrog works with the best cloud computing partners on the planet. Why? Because they’re the best computing partners on the planet. Our Solutions Squad vets them and our reporting processes continually track their performance. If something changes along the way and they’re not the best anymore, we know it and will switch to another partner that’s better. We want your managed IT services to be the best on the planet, too. The partners we choose to work with provide the best-in-class building blocks that let our managed IT talents shine. We use them to build and manage private clouds — both Leapfrog’s private cloud and the private clouds we build for clients — and to manage cloud services. Simply put, our partners’ building blocks work like they’re supposed to and last as long as they’re supposed to. If something changes along the way, we know it and we’ll switch to another partner that’s better. We’ll use what’s best for your business. Period. 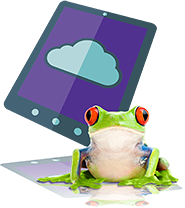 Frogs design and manage IT networks so they run smoothly — we don’t sell products. We live and breathe IT optimization. Cloud, non-cloud, integrated, everything. It’s not about the manufacturer or the vendor. It’s about the quality of the solution for your needs.